A young mixed martial arts fighter shares his struggles in and out of the ring in this candid memoir. Isip (10 Stacks to Success, 2014) fell in love with mixed martial arts when he was in junior high school in New Jersey. By 2001, he was a trained fighter and won his debut match. The training was brutal, and the emotional roller coaster of being a competitor often left Isip drained. But his commitment to the sport stemmed from another battle: his struggle with alcohol and drug abuse. As a teenager, Isip experimented with binge drinking, ecstasy, and other drugs, which never ended well. He and his friends invented something called Sexticy, an insane mixture of Cisco, Stacker pills, and Viagra. One particularly bad bender on Sexticy led to Isip’s brother intervening, but it was not enough of a wake-up call for the fighter. He then went to Miami and was arrested, an experience he shares in humiliating detail. Eventually, a dark depression settled over Isip, and a suicide attempt prompted him to reevaluate his life choices. The volume includes comic-book-like illustrations and photographs, enhancing the ease of the story. Set in a teenage New Jersey wasteland, Isip narrates scenes with fun dialogue, pop-culture references (his talk of pills includes an illustration of Jessie Spano’s meltdown on the TV series Saved by the Bell) and lots of Jackass-worthy action. But he mixes this narration with lectures on the effects of drugs and alcohol, including a condemnation of antidepressants that ignores the many people taking these pills who do not turn into addicts. His meditations on happiness, per the title, come too little too late. By far, the book’s best sections involve Isip as a fighter, describing the ego and arena of mixed martial arts with great passion. 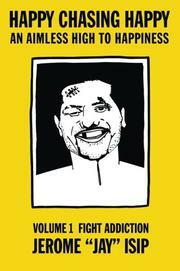 A straightforward narrative of drug addict to prize fighter would have made for a less manic memoir. An ambitious recovery account that entertains but fails to focus on addiction or redemption.